As expected, Castle was adjusted down vs. the preliminary ratings due to a Dancing with the Stars overrun by 0.1 to a 3.0 adults 18-49 rating, and Dancing with the Stars was adjusted up by 0.2 to a 4.5 adults 18-49 rating. Hawaii Five-0 was adjusted up 0.1 to a 2.5 adults 18-49 rating. There were no other adjustments among adults 18-49 ratings for new episodes on Monday. Yay for H50. If it was lead-in by M&M it could be higher. Castle beats Desperate Housewives.. whattt whatttt!!! @Baqinardo, I agree with you. M&M will be back to its original time at 9:30 PM next Monday. It does not help that there have been repeats during the last 2 weeks. I am sure some fans may not know there is a new episode last night. Congrats to “Castle”!!!! Ratings were up from last week (2.8 against NCAA Championships) too! Yeah, Castle still ran away with it. 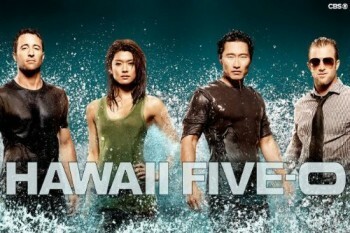 But good for H5O to hang in there despite a tough repeat/original/repeat schedule. I know how frustrating that can be. Yay for H50, it was a good episode last night. HFO’s had a bad week for it. Even revised up. I just hope CBS realise that their remaining Monday nights might struggle now and not let it impact them on their decision at the end of the season. They do seem to be in a bit of a slow mo collapse. I mean Mike and Molly? What happened? Castle does so well out of DWTS. These two shows obviously really complement each other. Other ABC dramas wasted the lead in whereas Castle runs with it – and without the lead in Castle is fairly flat. I think Castle will stay exactly where it is next season. An exciting and surprising new episode of H50 last night, where the fans found out more about some of the characters’ background. Daniel Dae Kim twitted the fans and answered their questions LIVE about the characters, story lines and H50 while the show was on last night. Oh and I wonder if CBS will be swapping Mike and Molly and 2.5 back round as this week seemed disastrous all round for CBS Monday? ABC would be insane to move Castle next season. It’s the only 10pm hit they have on their schedule. @Bluejays. Yes, CBS will move Mike and Molly back to its original time slot at 9:30 PM next week, before H50, a new episode, for April 18th. Maybe it was just an experiment by CBS last night. Well, that’s something of a relief, to see Five-0 2010 adjusted up. But god, Chuck, please, revive. REVIVE! Yahooo!!!! Go Castle! That does make it the only show on Monday night to go up in the ratings from last week right? Yay!!! Do The Castle!!! Maintains the 3.0 mark which is what i was hoping it would do. I think those numbers are very bad for Hawaii five o. No matter what. If the show had a strong fan base they would had turned to watch the new episode. No excuses for a 2.5. Castle is strong. I can see the show winning the time slot until May. Castle and Beckett are getting closer. Fans have been waiting for that. ok… done looking, yea as u can see nothing! ABC has given other shows the benefit of DWTS lead in, and nothing still has compared to Castle’s numbers. So now that abc has a 10pm hit after DWTS u want them to move it? they didnt move Brothers and Sisters from its Desperate Housewives lead in. They didnt move Private Practice from its Greys Anatomy Lead in. the point im trying to make is… DONT MESS WITH SUCCESS! and abc has found monday night success with this lineup. that is all.